This is the second in our series of looking back at the Georgia filming locations for The Dukes of Hazzard. It’s a little known fact that only the first five episodes from season one were filmed in Georgia. In fact, most of the filming took place during the winter of 1978 in and around the towns of Covington, Conyers, and Social Circle. After that, filming moved to the Warner Brothers Burbank Studios in Burbank, California and Walt Disney’s Golden Oak Ranch in Newhall, California. Synopsis: Daisy discovers she’s been hoodwinked out of her royalty money by music pirates for a song she sent to Jessie Coulter to record. The Duke boys drive to Atlanta to try to get the money back and get caught up in a raid at a recording studio by the local police and the FBI. The Duke boys practicing their archery skills while Uncle Jesse patches up the roof on the old farmhouse. The home was originally built by the Cox family as a log cabin in the 1800s. In the 1920s, additional rooms were built on the existing structure. After years of neglect, the home was eventually torn down in 2011. Today, all that remains of the home is a lone chimney. The Duke boys and Daisy are on their way to Starr Recording. The Atlanta skyline sure has changed a lot in 40 years. The Westin Peachtree Plaza Hotel (the round building) suffered considerable damage when a tornado hit downtown Atlanta in 2008. Over 500 windows were broken during the storm. Starr Recording is the home of the music pirates’ counterfeit music studio. The old building in downtown Atlanta hasn’t changed that much. However, the area surrounding the studio looks little like it did back in the late 1970s. Bo and Luke head inside Starr Recording to get Daisy’s $50 back. 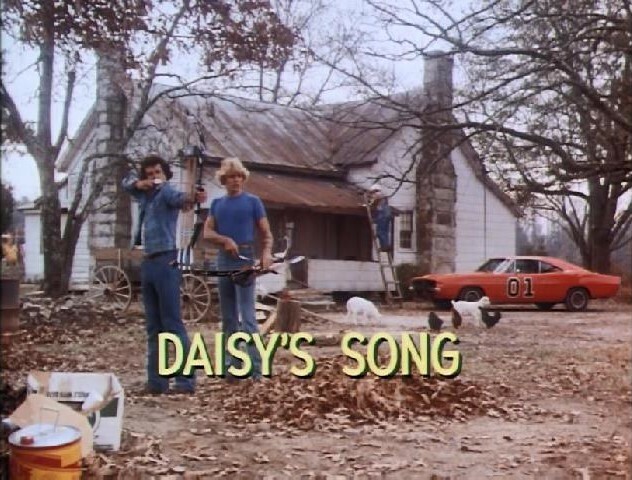 After failing to get Daisy’s royalty money back, the Duke boys and Daisy come up with another plan to get Daisy’s $50 back. One Atlantic Center now occupies the parking lot across the street from the recording studio. Bo tells his cousins his plan to get Daisy’s money back. The original location of the Mellow Mushroom pizza restaurant is across the street from Starr Recording. Boss Hogg making his getaway from Starr Recording when the police raid the studio. This is the alley on the side of the recording studio. Boss Hogg and his driver make their getaway from Starr Recording with Atlanta police on their tail. Bo and Luke make their escape out the recording studio’s back door during the police raid of Starr Recording. This is the first time we see Luke make his famous hood slide. He actually meant to jump on the hood, but his foot hit the fender and he slid across the hood instead. He also injured his hand when it grazed the radio antenna. Incidentally, all future General Lees had the antenna removed to prevent further harm. Boss Hogg and his driver making their getaway from the police at the corner of Peachtree Street and 14th Street at Colony Square. The old Fina station on the right is long gone. SunTrust Bank now occupies this location. The cops chasing Boss Hogg’s Cadillac down Peachtree Street in Colony Square. Boss Hogg’s Cadillac running from the cops through downtown Atlanta. Daisy sampling the barbeque at the pool party at Starr’s apartment. Daisy comes to Starr’s apartment to play her cassette of fake music. Bo, Luke, and Daisy leaving Starr’s apartment after Daisy convinced Starr to let her start recording counterfeit tapes. Bo, Luke, and Daisy try to shake the feds off their tail by running through Cooter’s junkyard. Daisy, Lester Starr, and Jojo leave Starr’s apartment on their way to the recording studio. An open field out in the country is where Starr hides an illegal recording pressing plant. Horsepower Memories would like to thank Mr. Dennis Nash for showing us around his property where the old Duke home once stood. His generosity and hospitality are greatly appreciated and we enjoyed our visit.